Alexander Campbell Mackenzie was born in Edinburgh on 22 Aug 1847. He came from a musical family – his father was the conductor of the Orchestra at the Theatre Royal Edinburgh, and Mackenzie was playing violin in it aged 8 years old – and was sent to Germany’s Sondershausen Conservatory (1857 – 62) to continue his education. In 1862 he won the King’s scholarship in 1862 to the Royal Academy of Music. By 1865 he was back in Edinburgh and he began teaching at local colleges. He done this for several years until 1879 when he went to Florence, Italy staying there till 1888, when he was awarded the position of Principal at the RAM, a post he held till 1924. 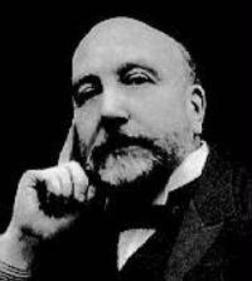 Mackenzie was the most senior of the three, the first to be knighted for his contribution to music in 1895 (Stanford was knighted in 1902, Parry was not knighted but was given the lower ranks of a Knights Bachelor in 1898 and then a baronet in 1902). Alexander Mackenzie died in 1935, 28 April. You are currently browsing the archives for the Alexander Mackenzie category.